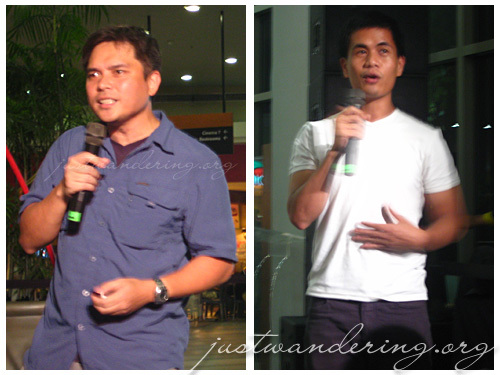 The 1st Pinoy Backpacking Festival kicked of yesterday with its first round of forums at the Trinoma Mall. One of the sessions last night was Backpacking 101, where Robert Alejandro and Jetro Rafael shared their 3-month backpacking trip through Southeast Asia and parts of China. It was the same story as the one they told four months ago, during the first session of Pinoy Backpacking 101 at ROX, but more polished and presented with an awesome video that takes us through their journey. They were followed by Roel Chan, ROX’s main guy, who taught us the basics of packing. He showed us different kinds of luggages, organizing your things using packing cubes, what to pack depending on the type of trip, the duration and the weather. Most of the stuff he featured in his talk are available at the Travel Club and at ROX. 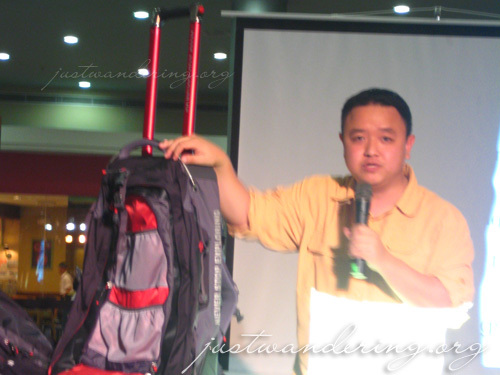 Roel demonstrating North Face’s trolley bag that converts to a backpack and has a detachable daypack. And did I mention it has shiny red pole thingies? I want. Back to backpacking, during their 3-month trip, Robert was kept busy sketching everything he sees, while Jetro does the same, only with a camera. The scenes they captured can now be seen through their book, Robert Alejandro’s The Sketching Backpacker and Jetro Rafael’s Backpack Photos (which is a nifty postcard book). 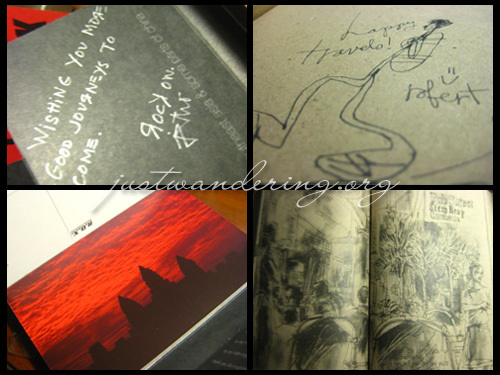 Each book sells for Php 395 and Php 295 respectively, available at The Travel Club and ROX. The session at Trinoma continues this afternoon with a Travel Sketching workshop for beginners and a Travel Photography workshop for beginners headed by the two intrepid travelers, starting at 4pm at Trinoma’s Cinema Lobby. The same round of session repeats the next two weekends, the 18th & 19th at the R.O.X. store at Bonifacio High Street and the 25th and 26th at Alabang Town Center. To register, send your name, mobile number, e-mail address and workshop date to pinoybackpacking@yahoo.com or you can SMS it to 0926-6933783. For inquiries, head on to the ROX Multiply site. Oh, and if you’re going, be sure to pick up a copy of their printed schedule. There’s a good packing list at the reverse side. These books can be yours. 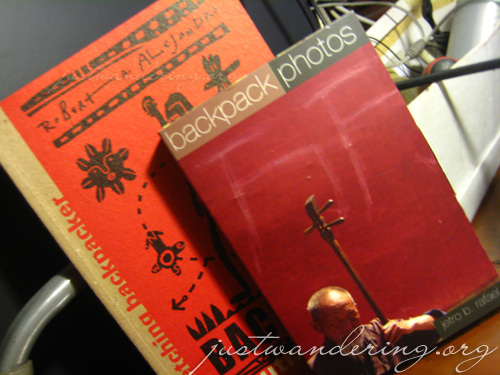 Want an autographed copy of Backpack South East Asia and Some Parts of China by Robert A. Alejandro or Backpack Photos by Jetro B. Rafael? Stay tuned, because Justwandering.org will be launching a contest real soon! Thank you VERY much for coming and writing about our little talk on your blog. I really do hope it was worth your time and efforts! they shared the same material during the backpacking 101 at ROX. i was able to attend it. looking forward for the contest. thank you for posting this Nina. ohmygosh! robert alejandro has a travel sketchbook? i love his art! he’s partly why i adore papemelroti products. is his book available in national bookstore? or maybe i can get lucky and win it from your contest…hehe. Sounds like an interesting event. It’s quite nice to see backpacking hitting the mainstream consciousness among Filipinos. Great way to see more of the world (and the Philippines!) without straining the budget too much.